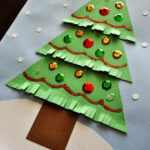 Looking for a quick and easy Christmas craft for the kids to make in the next couple weeks? I have got you covered! 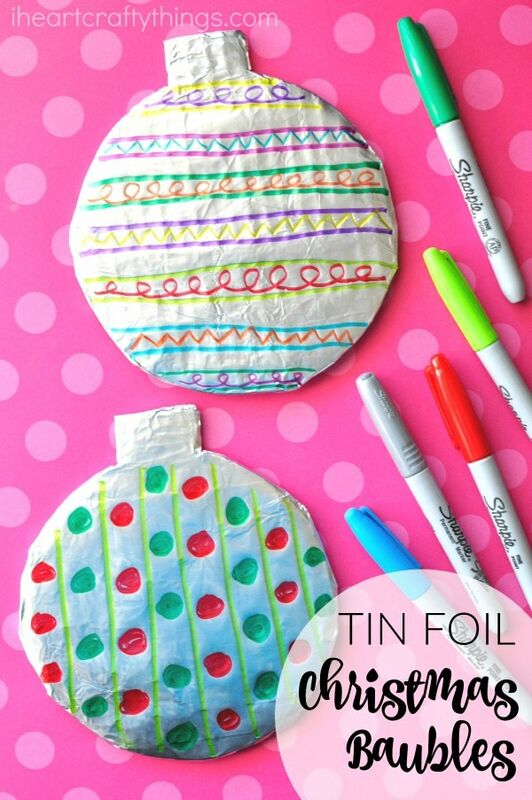 This Tin Foil Christmas Bauble Craft is great for toddlers, preschoolers and young elementary-age students…who am I kidding, even I enjoyed making one! It’s also great for preschoolers to practice drawing lines for writing readiness. The best part, it only requires 4 materials that I bet you already have on hand. If you love this craft, you will also love our Tin Foil Easter Egg Art. Check it out for a fun activity for the kids this spring. 1. 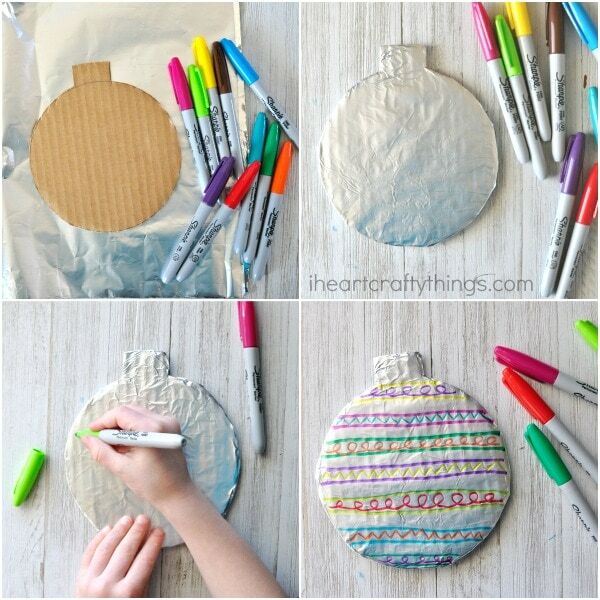 Start by cutting out the shape of a Christmas bauble from your cardboard. I found it easiest to trace a cereal bowl and then added a rectangle at the top. Easy, peasy! 2. 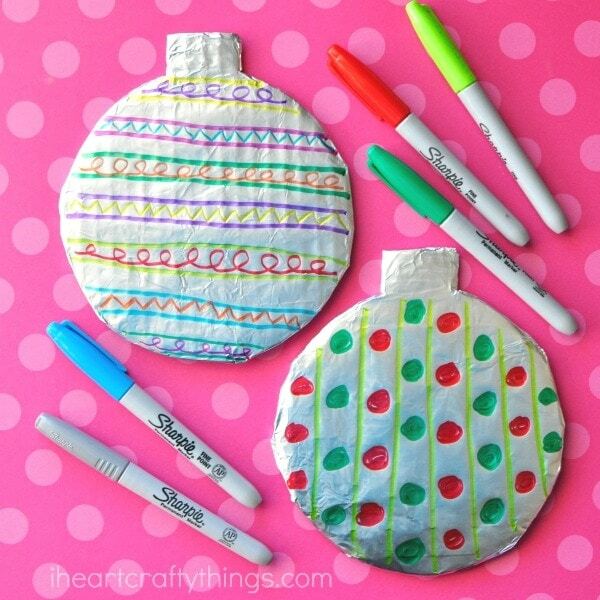 Tear off a piece of aluminum foil and use it to cover your cardboard bauble. The top part is a bit tricky. I use my scissors to cut slits alongside the top rectangle and then was able to fold the tin foil around it. 3. Get out your permanent markers. Any type of permanent marker should work but we love Sharpie markers. 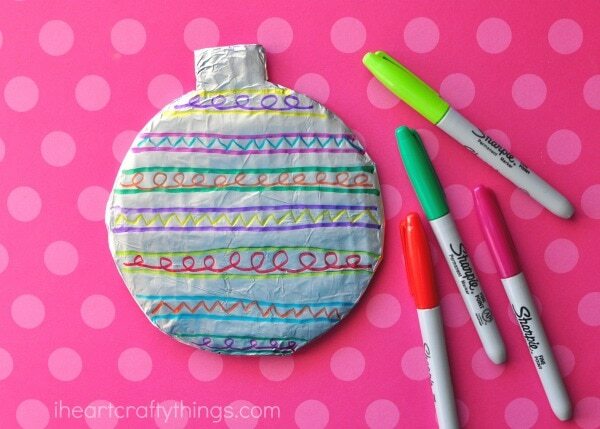 Now your child can sit and decorate their shiny Christmas Bauble Craft any way they want. 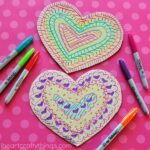 Draw straight lines, or squiggly lies, or polka-dots, or have fun with a mixture of everything. The end result of the shiny foil mixed with the bright colors is gorgeous! 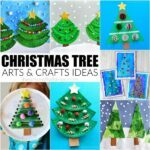 Hang your pretty Christmas bauble craft on a shelf to admire, or make several different baubles and connect them together to make a banner for your fireplace or another place in your home.